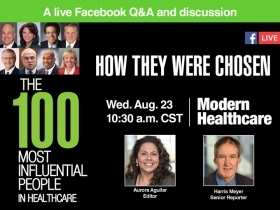 Modern Healthcare hosted a Facebook Live discussion Wednesday with Editor Aurora Aguilar and senior reporter Harris Meyer on how this year's 100 Most Influential People in Healthcare ranking was chosen. Aguilar and Meyer discussed the chain of events that shaped the 2017 rankings, as well as what could affect next year's list. If you missed the live chat, watch a replay of the session. Visit our 100 Most Influential gallery to see 2017's list.